And yet another milestone is reached. Three and a half years later, I'm writing my 400th post on a blog that I never thought would be this popular. Fast approaching 300.000 page views, I reckon it's safe to assume someone must read this thing. With the added responsibility of writing something worth reading, my choice of puzzles to review becomes a little harder, but I'm rewarded with the occasional treasure. 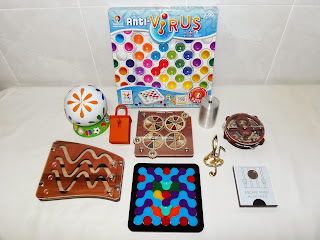 These treasures are what I like to call my top 10 from the last 100, a small list of puzzles I consider must-haves in any respectable collection. Read on, as I start the countdown from number 10. You can also click on their names for the full review and where to buy them. I start with my favorite puzzle designer, Jean Claude Constantin. With over 50 reviews on my blog so far, it's hard not to include at least one or two in the top. 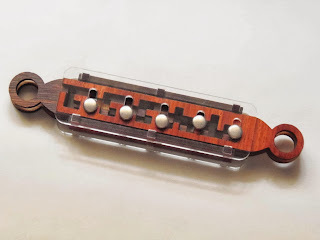 Die Welle has a very elegant design, it's a sequential movement puzzle, more specifically a quinary or 5-ary, and the goal is to move all three balls from the right to the left. Concentration and patience are required as you try and solve one of the best-looking sequential puzzles out there with an unconventional curved design over the more traditional right angled puzzles. Dubbed the round Rainbow Cube, the Twistball concept was designed by Josip Matijek in 1989, even though it was only launched a couple of years ago. The puzzle is well built and the movement is smooth, but the painted tiles aren't perfect, leaving sometimes a smudgy patch of paint. With 13 different Twistballs commercially available, ranging from easy to extreme difficulty, and a promise of more to come it's easy to understand why this Twisty puzzle has been so popular. Oskar's contribution to SmartGames portfolio is one of the best designs in puzzle games since Rush Hour. Probably not a coincidence, Anti-Virus has a somewhat similar concept to its older cousin. 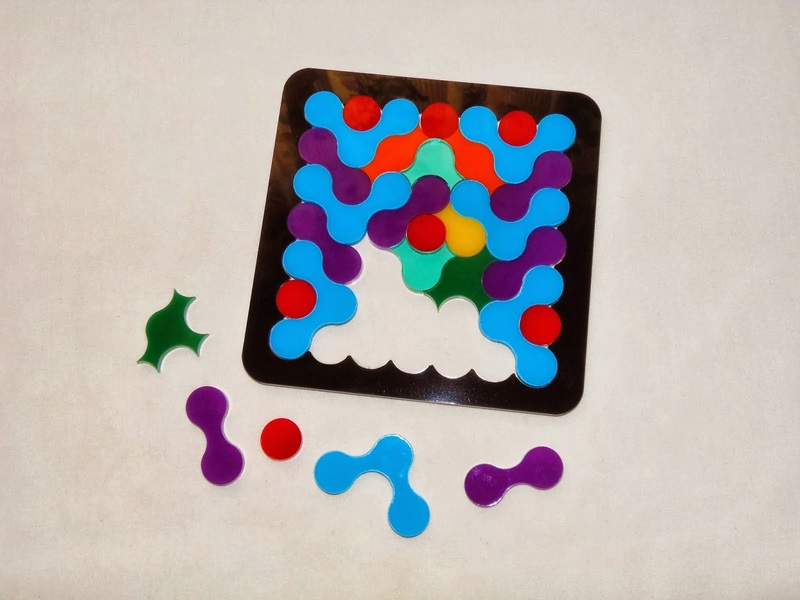 With nine colored pieces and two blockers (static tokens), your task is to get rid of the virus, the red piece, by sliding pieces along the board until you free a path to the exit point. I found the Anti-Virus a little harder than Rush Hour, mainly because the movement of the pieces is done diagonally which is less intuitive. A very colorful puzzle game with 60 challenges that will sure put your skills to the test. When Jerry Loo, a fellow puzzle blogger, launched his first ever puzzle design I was quite excited about it. After all, we bloggers weren't on the other side of the fence anymore. His concept? A very clever hidden mechanism inside an aluminum cylinder, simply called Ball in Cylinder No.1, where the objective is to remove a metal sphere. The puzzle was so well designed I couldn't ever thought it was coming from a newbie. Judging by the great craftsmanship that went into the building of Cylinder No.1, I can only expect great things from its successor. Every year at the International Puzzle Party, Robrecht Louage presents us with yet another great design. Over the last few years his contributions consisted of a very simple concept: a maze, a coin and some other features that it's best not to divulge. 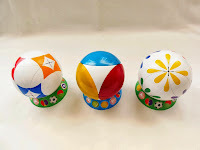 The goal is always the same, remove the coin, but what strikes me is that each year he comes up with a design seemingly better than its predecessor. 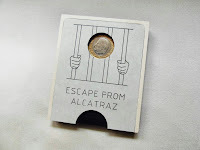 This year's puzzle was the Escape from Alcatraz, and the design alone is very original, but no matter how many of his puzzles you solve, he always has some way of surprising you and this one is no different. Splinter Spierenburgh is another talented puzzle designer that surprised me last year with his first design, the MazeRoll, also featured in the last IPP. I loved that puzzle so much that I had high hopes for its successor. Fortunately, Splinter delivered yet another piece of genius, the Burgh Lock. This is among the best Trick Locks I've tried so far and knowing that it's the first time Splinter has tried to build one of these it makes it even more special. 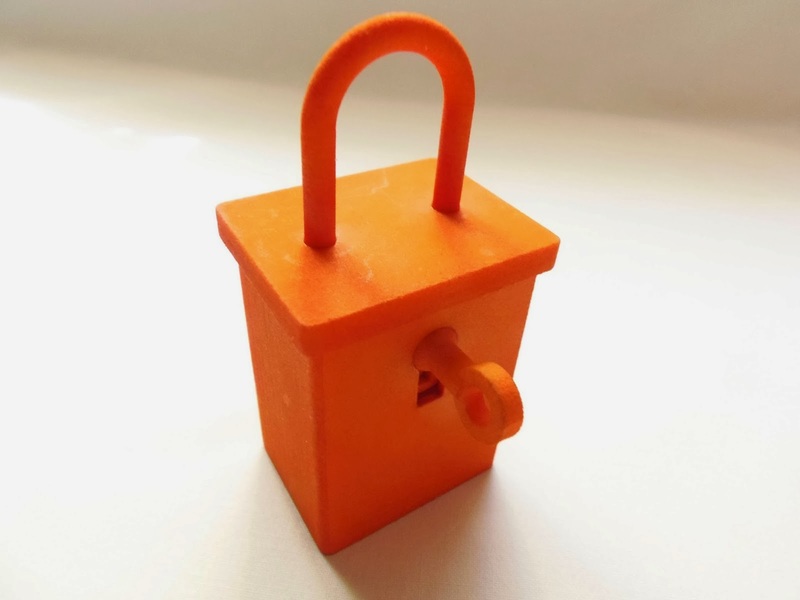 It's also the first Trick Lock made from 3D printing I've ever come across with. Over the past year I've been quite obsessed with Siebenstein-Spiele for their magnificent craftsmanship and gorgeous puzzle designs. Similar in style to what you know from Jean Claude Constantin it's easy to fall in love with their puzzles too. 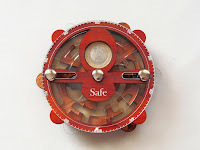 The best-looking one I currently have in my collection is the Safe, a superbly designed puzzle by Jürgen Reiche reminiscent of a measure instrument from centuries past. The puzzle features a double maze with rotating discs and a trapped coin. 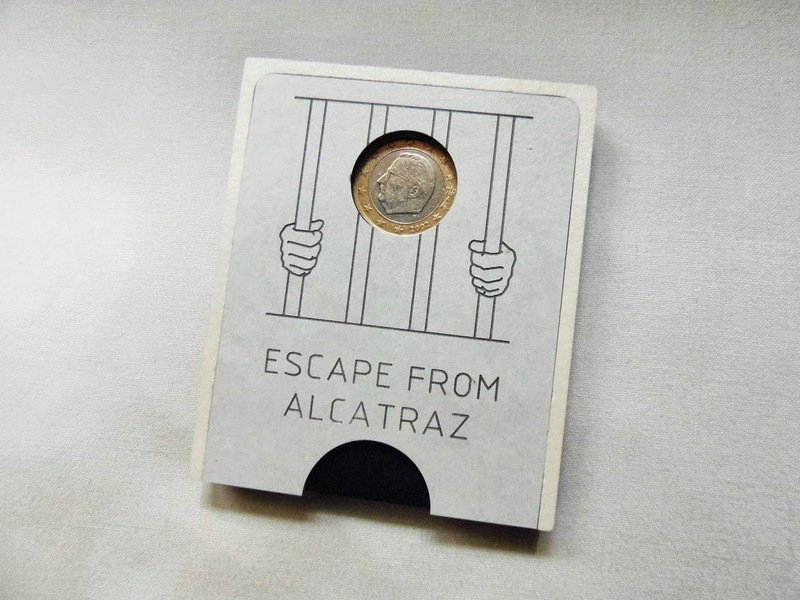 The object is to simply remove the coin, but the puzzle itself is very challenging. An excellent puzzle for the more experienced puzzler. 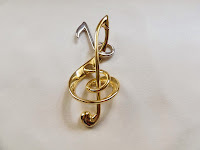 Designed by a Russian duo, Dmitry Pevnitskiy and Kirill Grebnev, the Cast Harmony is one of the most beautiful puzzles ever released by Hanayama. The puzzle was first introduced in the 30th IPP and even won two awards that year, the Puzzlers' Award and the Jury First Prize. The goal is to separate both pieces and that's not even hard to accomplish, but the design speaks for itself. Puzzle design is an art and the Cast Harmony proves it. I'm a sucker for puzzles that offer you plenty of challenges and different ways to play with them. The Roundominoes, designed by Kate Jones and produced by Puzumi Puzzles, is a perfect example of best value for money, as it comes with a 15-page booklet full of challenges for you to solve, including a few 2-player games. Made from 28 laser-cut acrylic pieces and seven vibrant colors it's very easy to get absorbed into this mesmerizing design and its addicting challenges. A true puzzler's dream. Despite being my favorite puzzle designer, it's actually the first time one of Constantin's designs made it into number 1 in my top 10's. It just shows you how unique this puzzle is. I guess you could say it was love at first sight, since I was instantly drawn to it when I first saw it. All those gears and the different wood colors combine in a perfect way to make it one of the most stunning puzzles I currently own in my collection. The goal is to have all touching colors in the four main gears match. Once mixed up, it's actually a very tough puzzle to solve, but it's pure fun and joy to play with it. Absolutely recommended for anyone slightly interested in puzzles. There you have it. 10 perfect gift ideas for the coming holidays. As always, for me, it's great to look back and see another 100 posts published, see the blog growing in numbers, see the comments in the reviews and getting feedback from you. Here's to another 100, and next time it's gonna be special with my 500th post. Stay tuned for more and thank you for reading. A Minotaurus has always been an intimidating mythological creature, but since they're not real there's nothing to worry about, right? Well, Siebenstein-Spiele's Minotaurus puzzle is very real and quite intimidating as well, so be prepared for an herculean fight with this beast. 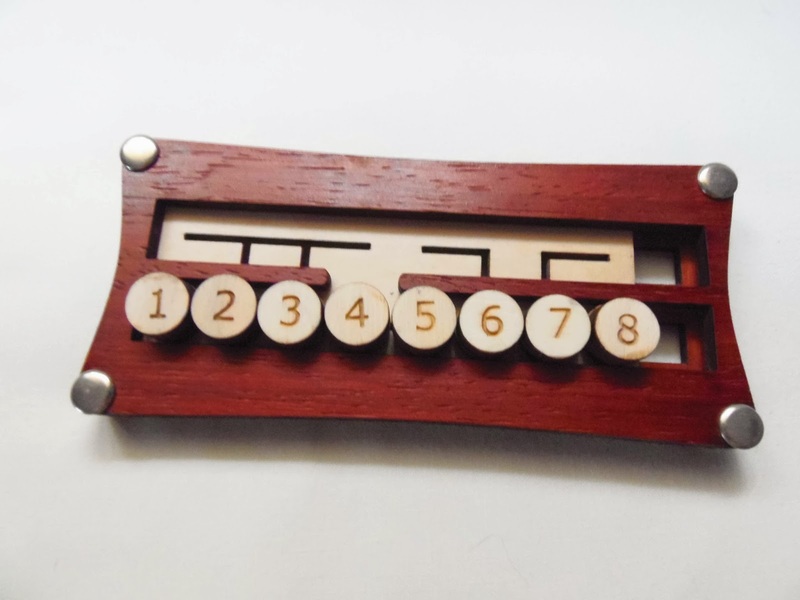 It was invented by Jürgen Reiche, who designs all wooden puzzles manufactured by Siebenstein. 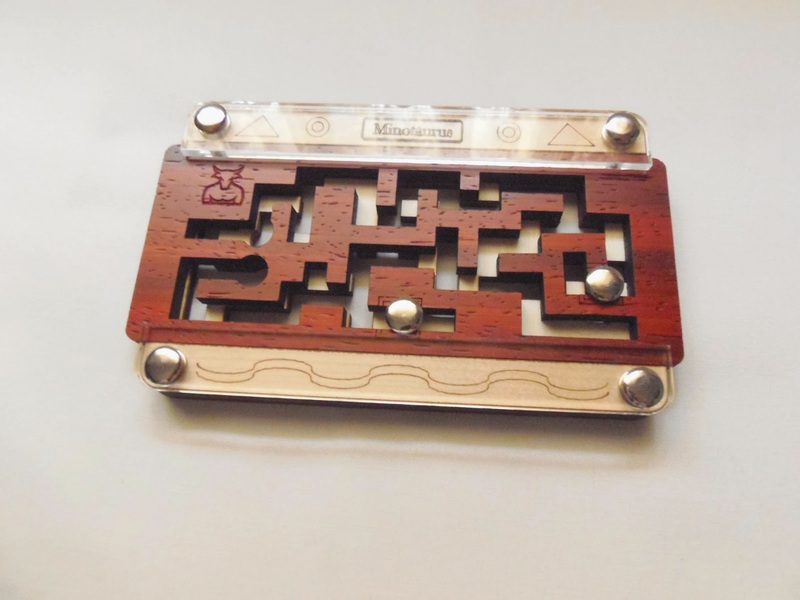 Minotaurus is a sequential movement puzzle with two distinct mazes, and you navigate with two screws through them from one position to another. 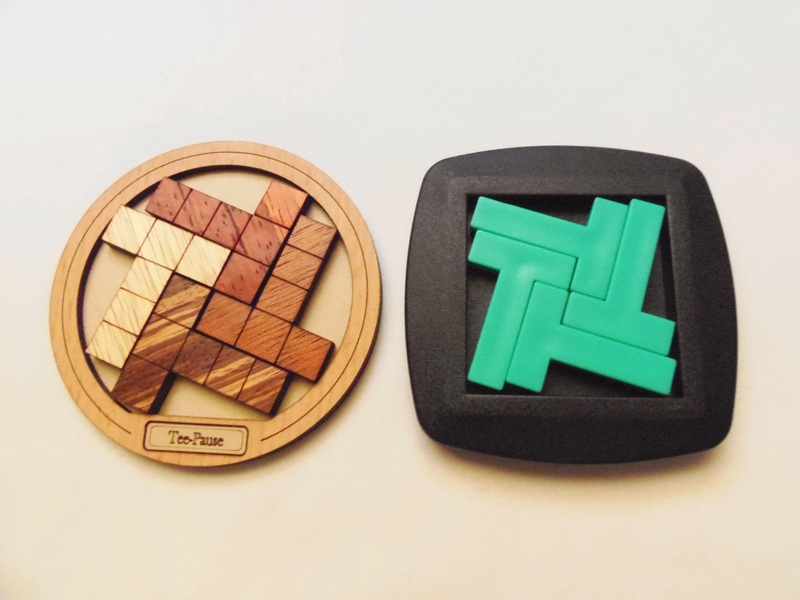 The puzzle is superbly built with two wood colors, mostly just to distinguish them apart, and has a sliding mechanism that moves left and right. The size of the puzzle is satisfying enough for a comfortable play, measuring 14.8cm x 8.7cm. You have to be constantly moving the two screws around to prevent your moves from being blocked. You start with the two screws in the bottom right part of the mazes. The starting positions are also marked in the top maze, so it's very easy to get started. As you try to move one screw around you'll notice that many of the movements will be blocked by the other. The trick is to alternate between them and make one movement at a time, always trying to anticipate where each screw needs to go in order for the other one to get where you want it. 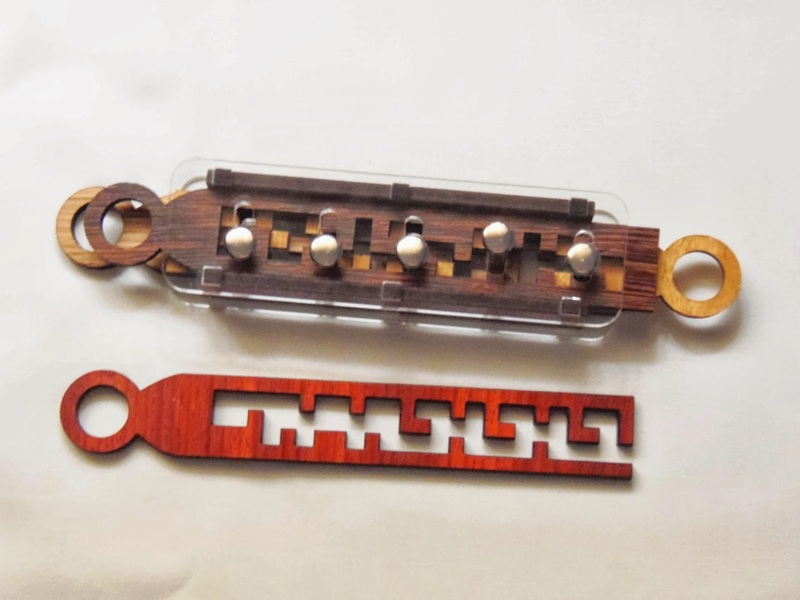 The design reminds me a lot of Jean Claude Constantin's Two Keys puzzle. 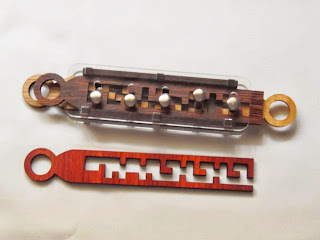 The difference is that the Two Keys had just one screw and the two mazes were smaller, but the concept and mechanism is very similar. I see the Minotaurus as an advanced version of Two Keys, for more experienced puzzlers. There are lots of dead ends and you'll feel a bit lost sometimes, but try to focus on the bottom maze and plan your route as best as you can. Treat those two screws as a team working for the same objective: reach position B, on the left end of both mazes. 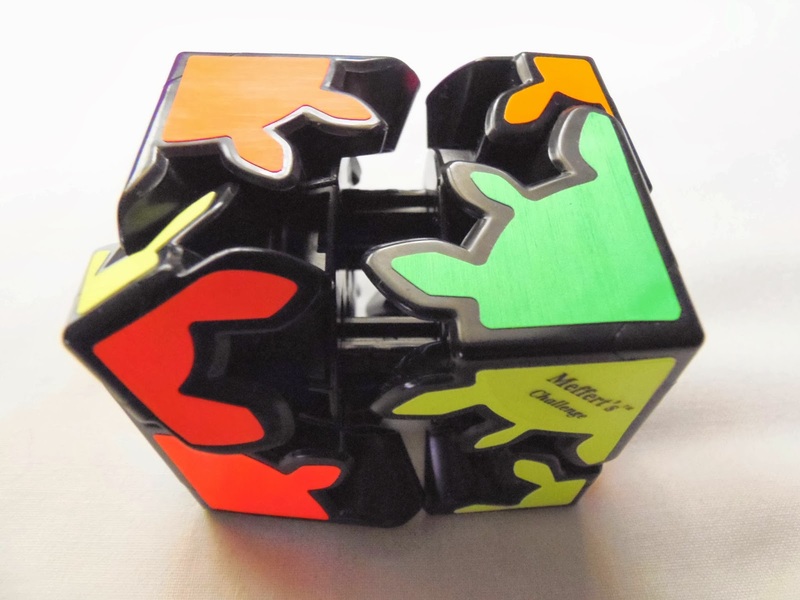 The difficulty of the Minotaurus puzzle is as tough as you'd expect a sequential puzzle to be. It's rated as a level 6/7 on the manufacturer scale and, to be honest, I wouldn't be so surprised if this one was actually a level 7/7. On my first attempt it took me about 15/20 minutes to solve it, with lots of backtracking. I was able to cut it short to a little over 5 minutes on subsequent tries, but it wasn't easy, since there are a lot of movements and knowing them by heart is a monumental task. I still haven't learned all the exact movements, but I know have a better idea on where to place the screws at key moments and the route is less random as the first times. 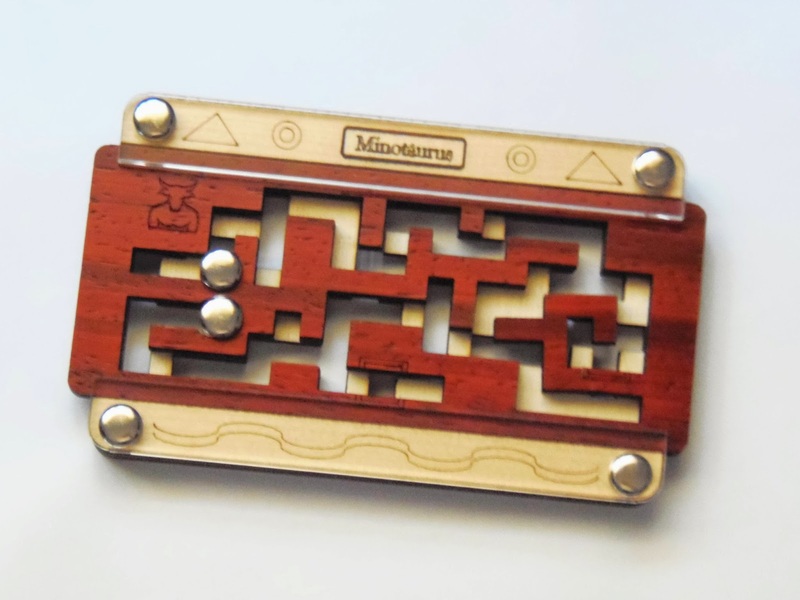 The Minotaurus is certainly an intimidating puzzle and it's not for everyone. If you feel courageous and capable of tackling the most challenging puzzles, then this is the right one for you. On the other hand, if you're easily frustrated by an extremely difficult puzzle, I'd recommend you try something a little less complex. Note that Siebenstein-Spiele also has much easier puzzles on their catalog. Availability: The Minotaurus puzzle is available at Sloyd.fi for €17.50. 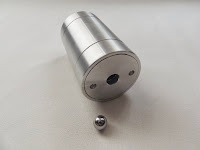 You can also buy the larger version, with balls instead of screws, for €25.80. Picture Frame Puzzles are always a joy to play with. 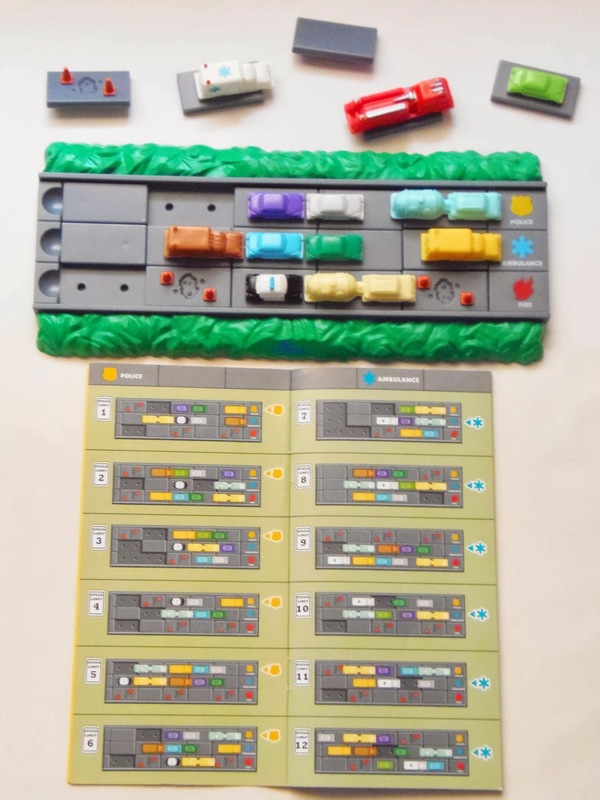 These are some of my favorite packing puzzles and I'm proud to own several different designs in my collection. 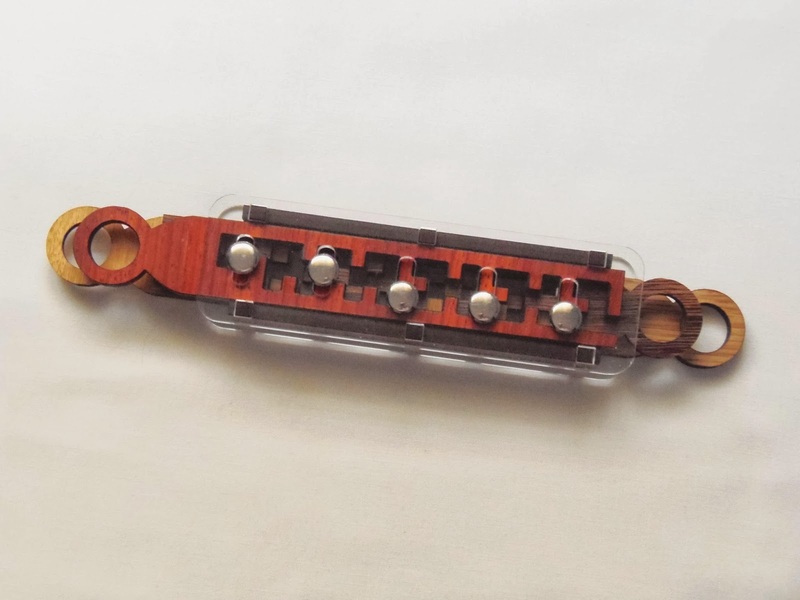 Dave Janelle, from Creative Crafthouse, makes some of the best puzzles in this category with such varied themes as animals or music instruments. 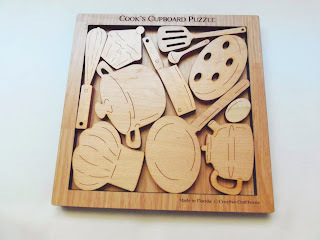 The Cook's Cupboard, unsurprisingly, is a superbly designed puzzle with gastronomy as its main theme. All the pieces in the puzzle are essential objects a cook must have in his cupboard, from the cleaver to the whisk. There are 11 unique objects with different sizes and shapes, all made from precision cut high-quality hardwood. All puzzles from Creative Crafthouse are quite big in comparison with other packing puzzles, measuring 17.8cm (7"). Holding and packing bigger pieces feels much nicer and more pleasant than tiny ones. A word of advice for when you unpack your puzzle: do it upside down or ask someone to remove the pieces from the frame for you, because it comes packaged in its solved state. Since there's only one possible solution, excluding rotations, it would be a bummer if you were to see the puzzle already solved. When you have all pieces nicely scattered try to put them all back in the frame. Note that you should only use the side of the pieces that's marked or engraved. The key to solve any Picture Frame Puzzle, as I've been saying in previous reviews, is to look out for possible matches between some of the pieces' edges. You should always try to pack them as tightly as possible so you don't waste too much space. There will always be some empty spaces between the pieces, but you'll see that once it's solved it has the most optimal arrangement for all the pieces. The Cook's Cupboard may be a difficult puzzle, but it's one of the best works by Dave Janelle. There are still so many that I don't have in my collection, but if I had to recommend a couple of them this would certainly be a great choice. It's a perfect gift for a cook or gastronome. 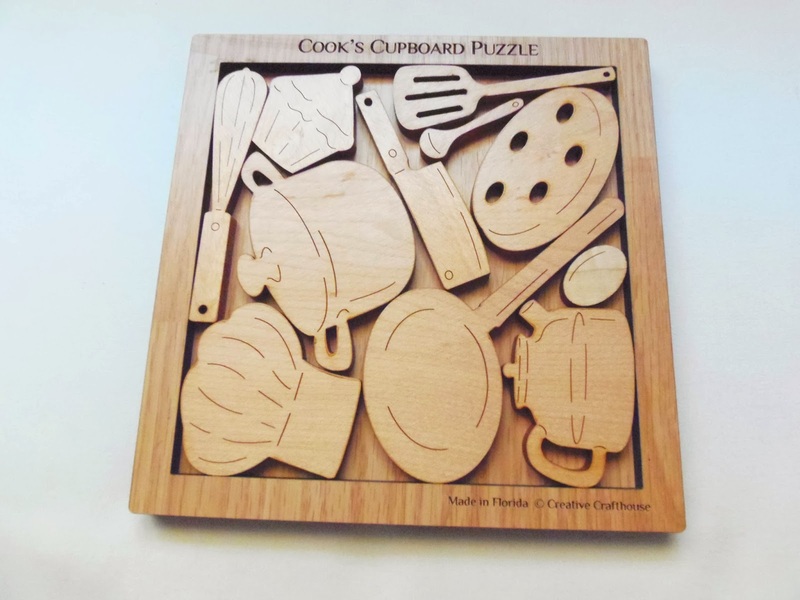 Availability: The Cook's Cupboard puzzle is available from PuzzleMaster for $24 CAD. Check out other designs by Dave Janelle. What happens when you combine one of your favorite puzzle types with your favorite designer? Nur 8 (literally translated as "Only 8", a.k.a. 8-Puzzle) happens... 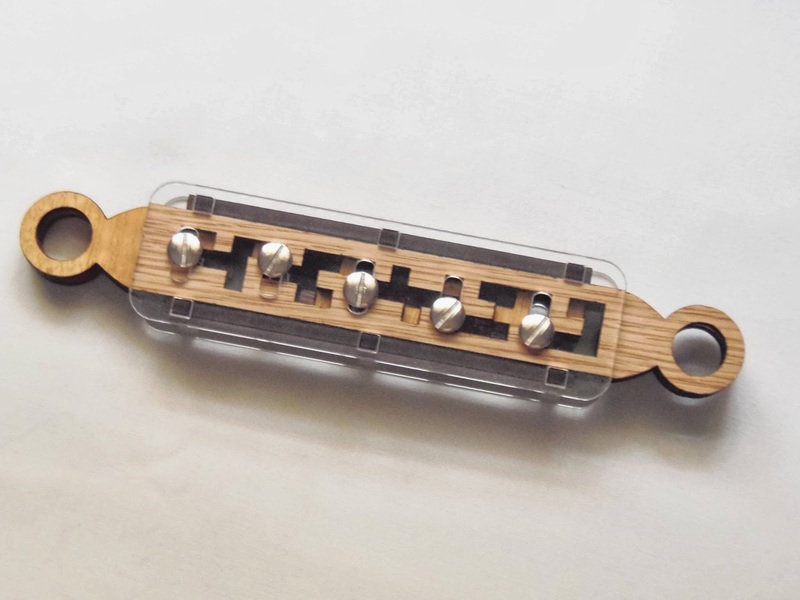 Designed by Jean Claude Constantin, Nur 8 has a very interesting sliding mechanism like no other puzzle I've ever seen. 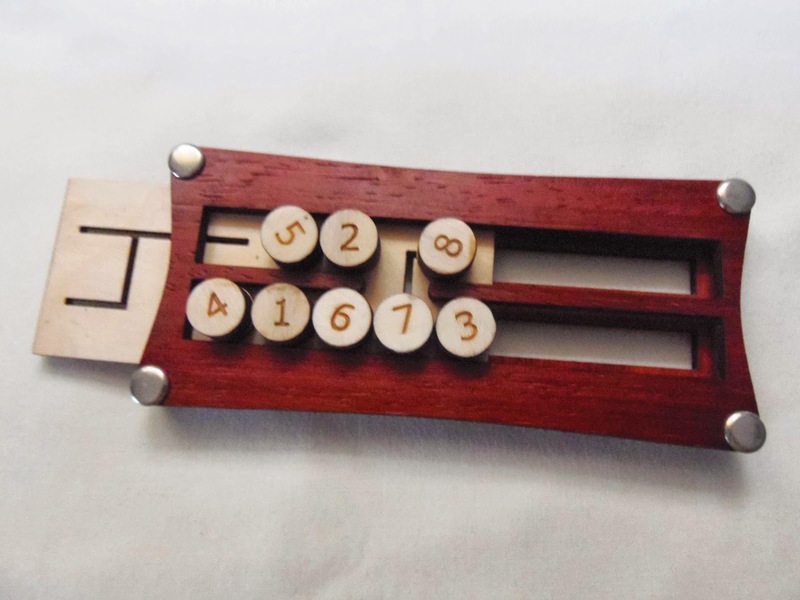 So, as the name suggests, the puzzle consists of eight numbered pegs that slide in any of the four main directions, but with some restrictions. There are these slots running across the length of a sliding platform that have different paths, like a maze of some sorts. 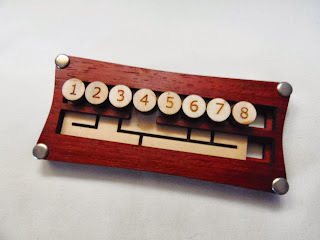 The idea is to move all eight numbers to the bottom part of the puzzle with the correct order. As any good maze is proof, doing that won't be a walk in the park. A little planning and good strategy should more than enough to solve it without a hitch. The design is simple but elegant. The usual contrasting wood colors are present, with a dark tone for the frame and a lighter color for the sliding platform and pegs. The numbers on the pegs are engraved, so you don't need to worry about them fading away with time. It measures 15.5cm by 7cm (6.1" x 2.8"), which is big enough for comfortable play. The puzzle comes with the numbers in the correct order, but in the upper part. As you try to move the numbers to the bottom you'll see that it's not possible to arrange them from 1 to 8 straight away. You'll need a bit of a controlled chaos. In other words, you shouldn't worry on how to get the number 1 in its correct position on your first moves. For the platform to move freely from left to right and vice versa you need to make room for other slots to become free, since there's only a gap between the upper and bottom parts large enough for one peg to go through at a time. The solving process can be described as sequential movement, but not n-ary. There's no right or wrong sequence per se, just a sequence that can take more or less movements, depending on your skills. As far as difficulty goes, I didn't find it much difficult. It took me about 10 minutes to solve it. From a scale of 1 to 10 I'd say this one's about a 6. Much easier than it looks, actually. Nur 8 by Constantin is yet another gem when it comes to original concepts. Being a sliding puzzle fan as I am, this is the icing on the cake. A simple looking puzzle and yet so fun to play with, despite not being very challenging. A must-have for any Constantin fan. Availability: You can buy the Nur 8 (8-Puzzle) at Sloyd for €18.15. 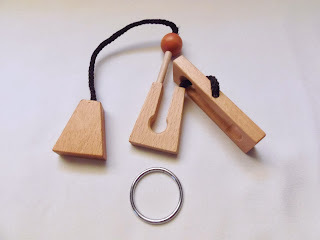 Day Trip is a rope puzzle from Eureka's latest series, the Bon Voyage puzzles. 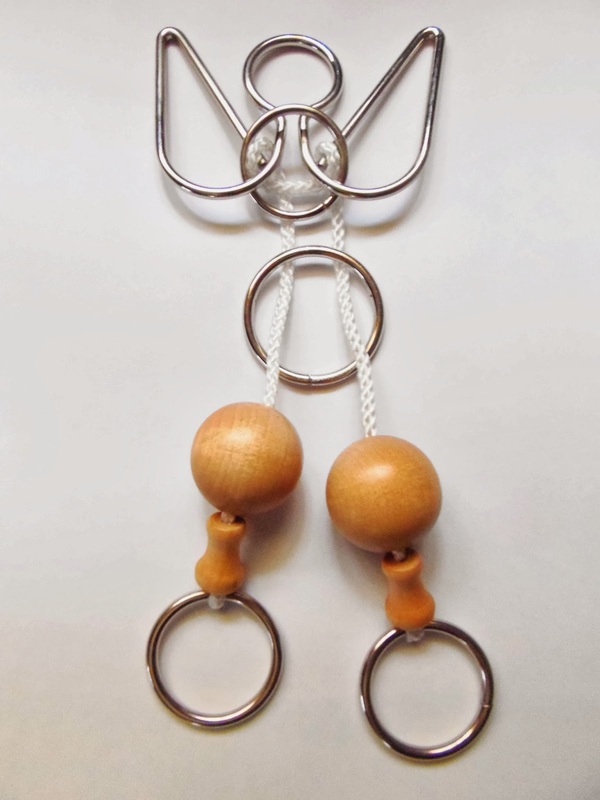 This is a collection of nine puzzles, all rope, with travelling as the main theme. Even their names are holiday-related. These also vary in terms of difficulty, from 1 to 3 stars. Day Trip is rated as 3 stars, so this won't be a picnic. The original version, the Tricky Dicky, was designed by Rick Eason - Thanks for the info, George! 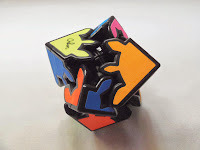 The design of these puzzles is very colorful and vibrant. This is actually where Eureka excels at, presentation. They're also small compared to other puzzles of the same type, which could be great to take them with you on your travels. Day Trip's design actually looks quite simple, but looks can be deceiving and, in this case, very true. 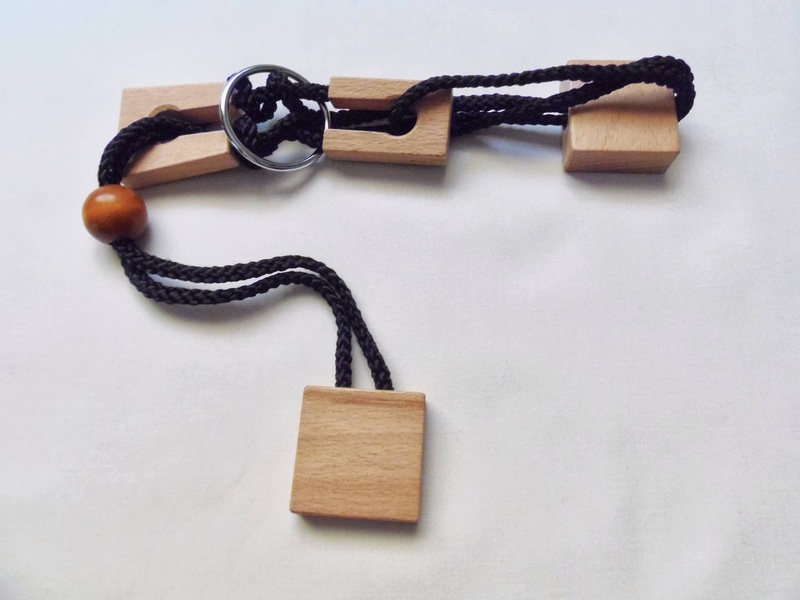 The puzzle consists of two different sized sticks attached together by two pieces of rope. 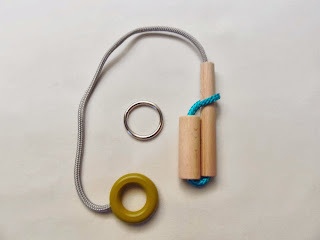 At the end of the larger stick there's a lengthier rope with two rings attached, a colored one at the other end and a metal one that can move up and down along the rope's length. Your task, as you might have guessed by now, is to free the metal ring from the puzzle and put it back to its original position. Be prepared, because this one could take a whole trip to figure out. To solve the Day Trip it actually took me more than a day, about two hours total. Most of that time, however, was spent untying knots that I involuntarily did while attempting to solve it. 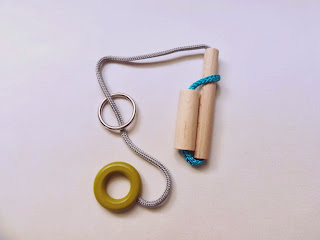 The small rope loop found between the two sticks was mostly responsible for the knots, since it becomes very easy to "collect" a few knots with just a couple of moves around the puzzle. My advice here is to never make a move without first studying how to reverse it. If you lose your train of thought for a moment it will be very hard to reset the puzzle and start again. Day Trip is a terrific challenge and, despite all the frustration, a very rewarding one. I have another puzzle from this series in my collection to try, the Summer Holiday, and so far I'm impressed by their quality. Stay tuned for my thoughts on the next one. Availability: You can get a copy of the Day Trip puzzle at Puzzles de Ingenio, in Spain. Worldwide shipping available. Tee-Pause is a great example of how presentation in puzzle designing makes a big difference to distinguish great puzzles from average ones. 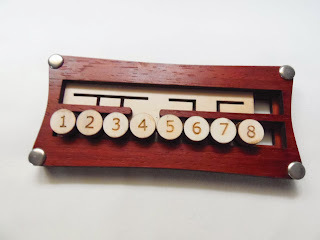 The puzzle itself is a fancier version of an older packing puzzle, The Four T. There are quite a few versions of this puzzle out there, and I happen to own two of them besides the one you see here, a plastic one and a wooden one. 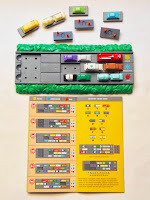 My favorite so far is the Siebenstein-Spiele's version, designed by Jürgen Reiche, the Tee-Pause. This packing puzzle is very simple. It consists of only four identical T-shaped pieces that need to be all neatly packed inside the tray. There's a major difference between Siebenstein's version and the original, and that's the actual packing area, which is round. Well, not perfectly round, since the bottom is flat, making things a little more interesting. As expected, Siebenstein's presentation is flawless. Each of the four pieces has a different color, including the frame itself. 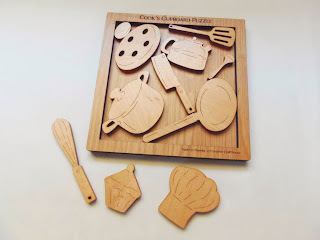 Built from laser-cut wood, both pieces and frame have perfect shapes and when solved, all pieces fit tightly within the tray area. The size is a bit small, the diameter measures only 8.9cm (about 3.5"), but since you're manipulating only four pieces it's not an issue. 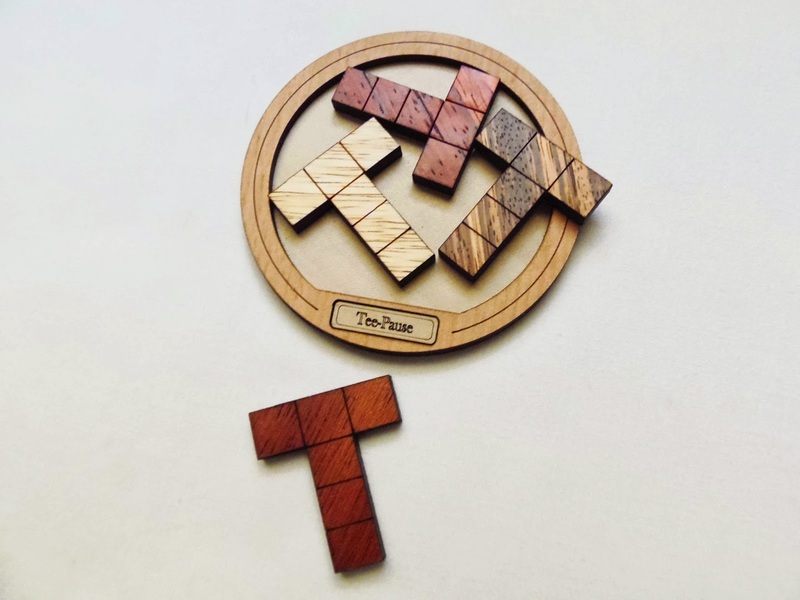 When I saw the puzzle for the first time I suspected the solution was very similar to The Four T, but what really sold me was the look of the puzzle. Since I already knew how to solve the original version it didn't take me long to solve it. The small detail on the bottom actually makes it slightly harder, as the area is truncated and you have to pack the pieces with the exact orientation. Nevertheless, it's still basically the same solution and if you already solved the original version there's not much challenge left. This is classified as a level 8/10, but even knowing the solution I don't think it's more than a 7. Solution: Click below to check both solutions, the original and Siebenstein's. If you love Siebenstein's puzzles you can't go wrong with Tee-Pause. 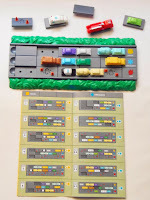 Yes, it's not a new puzzle per se, but the overall presentation makes for it and it's a must have in any collection. Availability: You can get a copy of Tee-Pause at PuzzleMaster for just $11 CAD. If you'd like, you can also browse other designs by Siebenstein-Spiele. This is a long overdue review I've been wanting to write for months, ever since I got this puzzle back in June, but time and other puzzles kept me from doing it... Until now. 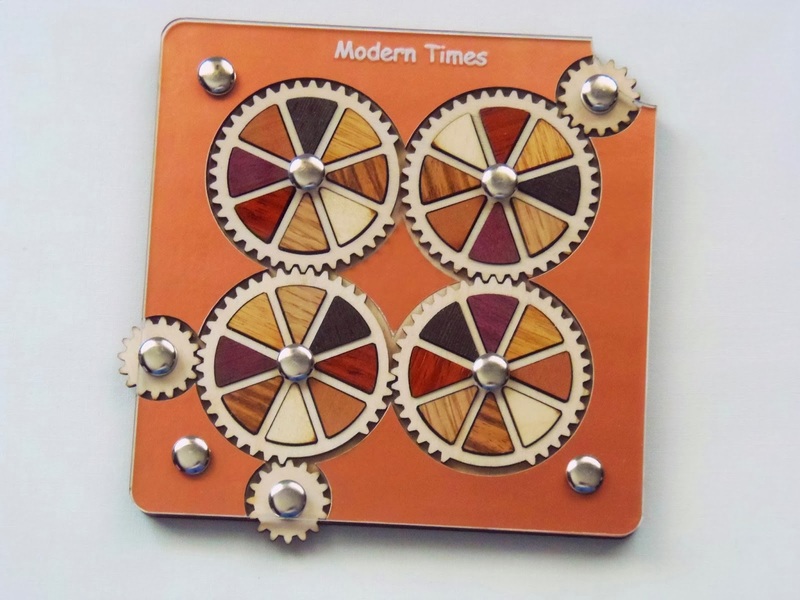 Modern Times has got to be one of the most strikingly beautiful puzzles from Jean Claude Constantin I've seen so far. The concept isn't new, although it does add a couple of new elements, but when I look at its visual appearance I don't really care if it's revolutionary or not. It's Gorgeous! The first thing that surprised me about Modern Times was its size, which is bigger than I was expecting. This actually happens to me a lot when I'm browsing for puzzles, since their size is the last thing I check. I basically take a look the photo and its description. I sometimes get surprised too, but on the bad side. Not this time though, as the puzzle measures a good 14cm x 14cm (about 5.5"). 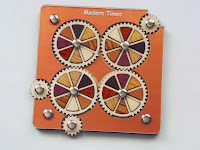 The puzzle is made by a combination of laser-cut woods in various colors, with each wheel having eight different colors. The top of the puzzle is protected by acrylic and to complement the design a sheet of reflective paper, resembling brass, is also used. The aspect of the puzzle reminds me of some sort of a clock mechanism from centuries past, where you'd have to manually wind it. Playing with this puzzle is a pleasure and the movement is really smooth. Note that in order for that to happen the wheels' teeth need to be properly aligned. You don't touch the actual four main wheels though. 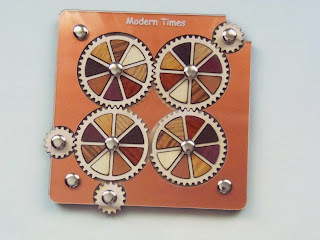 The movement is done by turning the smaller wheels that are placed at three different positions and you can only move two of the bigger wheels directly, at the top right and bottom left. Another interesting design feature of the puzzle is that the wheels' teeth don't cover all their perimeter. Some of those areas are flat and will keep the wheel from moving relative to the others. This particular fact makes the puzzle quite complex to solve, but that's also what makes it so fascinating. 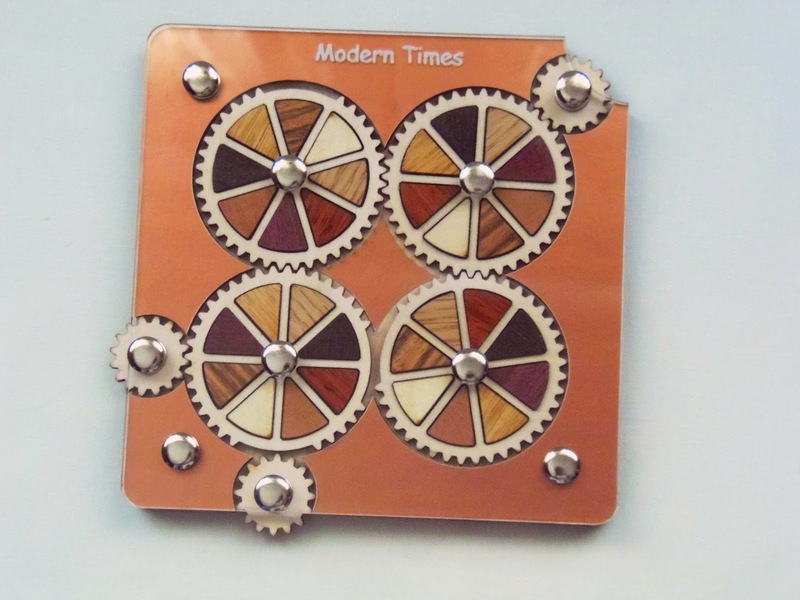 Modern Times can be classified as an Edge-Matching puzzle. Each wheel has two adjacent neighbors and the colors that are touching each other have to match. Sounds simple, but when you combine this simple concept with a complex mechanism you're in for a rather challenging puzzle. Just a few moves are enough to completely mess up the arrangement of the wheels, but remaking the original pattern is anything but easy. Anticipating the movement of the wheels and predicting where each color might end up is also a complex matter, due to the gaps in the wheels' teeth, which vary from wheel to wheel. A closer look at the puzzle reveals that one of the wheels actually has all its teeth so it will always move when you turn its connected smaller wheel. Playing with all these constraints and variables is fun but also a little frustrating, especially when you have almost all the colors in place and need to move a correctly placed wheel, just to make a mess out of it in the next steps. Solving time is hard to measure, because it depends on how well you understand the movement of each wheel. My solving time is nothing to be proud of, since it took me a couple of weeks to finally solve it. I have made an effort since then to solve it a second time, but I have yet to find patience to completely solve it. I actually find it more fun just to fiddle with it without any particular goal. 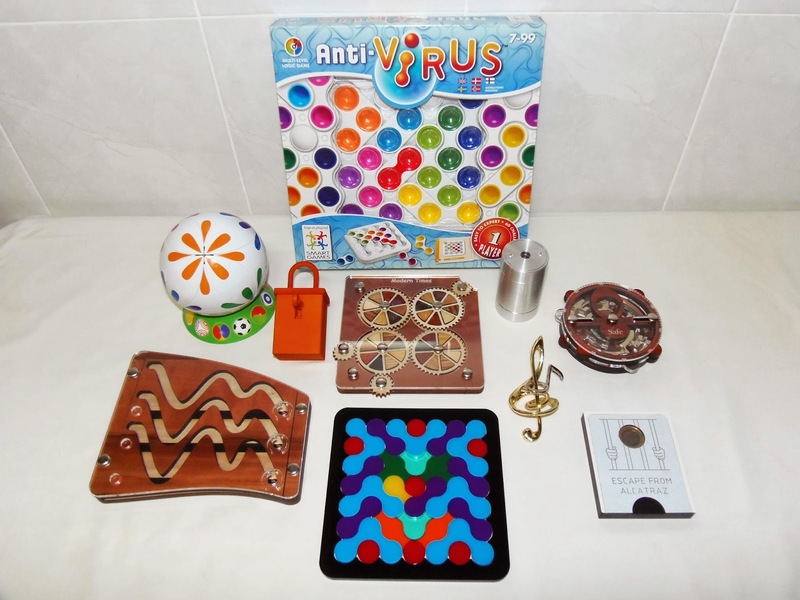 Constantin has so many great puzzles that it's hard to pick just one to be your favorite. If I had to choose, however, I reckon Modern Times would be a perfect candidate. I keep it proudly on my collection as one of the top 10 puzzles among over 1000 so far. This is why I collect puzzles. Availability: I got the Modern Times from a German Store, IQ-Shop.de, but as of the writing of this review it's out of stock. You can also find in this store other unique Constantin designs. PuzzleMaster currently has it in stock, here. The Owl is my third puzzle from the Flabber Floovers collection. Released by Family Games America, this collection of 12 unique puzzles, mostly rope ones, brings enjoyment to all puzzle fans with four difficulty levels, whether you're an experienced puzzler or just a beginner. Today, I bring you a more challenging design, a level 4/4, or at least they say. I actually found it a bit easier than I was expecting, but I'll explain in more detail below. The puzzle itself is quite intimidating at first sight, with a large rope length, enough to scary away the most courageous of puzzlers. 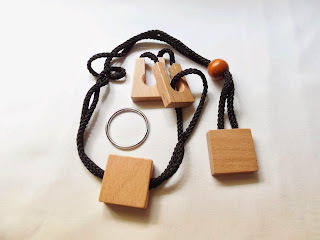 No wonder it looks so complicated... With four wooden blocks plus a bead and finally a ring to free, you have many things to worry about and too many parts that can make the puzzle a real mess with knots. Two of the wooden blocks look very similar in shape, but one of them is slightly wider, enough to block the ring from passing over it. There's a couple of knots between these two blocks that need to be untied before doing anything with the ring. Only after that you're going to include the ring in subsequent steps. As I mentioned above, the puzzle turned out to be much easier than I'd thought. I was clear that those knots between the slotted bars needed to be taken care of before doing anything else, and while they looked complex at first, it was actually pretty intuitive to untie them. When you finally clear the space for the ring to get between the two bars, it immediately reminded me of the classic Horseshoe puzzle. And it wasn't any coincidence, as I was able to perform the same exact steps to free the ring as you do with the Horseshoe puzzle. I was very surprised to solve the puzzle quickly, but even more surprised to see a different and more advanced version of a well known classic. Since the solving process was rather easy to do, putting the ring back to its original position was even easier. I wish more puzzles were like this one, easier than you expected. The Owl is now my favorite puzzle from the Flabber Floovers collection. 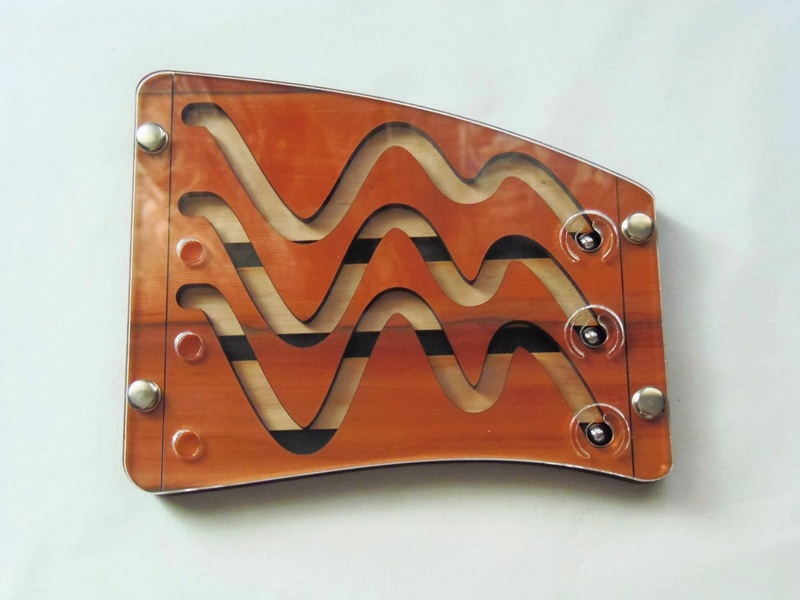 Not because it was easy to solve, but because it takes a simple design like the Horseshoe puzzle and adds its own elements to create one of the best variations I've seen in a while. Definitely recommended, and even if you're a beginner go for it, because it might surprise you by how simple it really is. Availability: You can find the Owl and all the others in the Flabber Floovers collection at Puzzles de Ingenio, in Spain. Worldwide shipping available. Angels are supposed to be worshiped and harmless, right? Well, not The Angel I got from Sloyd though. Might as well be a fallen angel. This is one tough nut to crack and solving it will require you to learn some new techniques. The Angel is actually one of the best wire/string puzzles I've seen for a long time, and I've played with a fair share of them before. 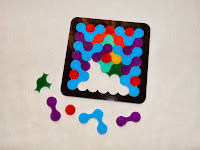 First, the puzzle is very well designed, with a perfect and symmetric shape. Even the color chosen for the string is white, which goes very well with the theme of the puzzle. The puzzle itself is quite challenging to solve, but when you finally do it you'll certainly feel a great sense of accomplishment. 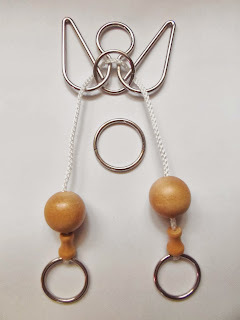 This is a level 4/5 puzzle and, to be honest, I would've classified it as a pure level 5, mostly because of its complex movements, which in all fairness aren't that many, but enough to create a real mess with the string. The time to solve, at least for me, would also justify a level 5, and in this case it took me over two hours (not straight), between failed attempts and undoing several knots. 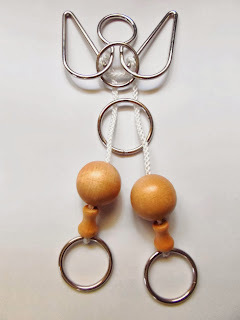 As you start, you see a large ring in the middle with two ends of the string going through it. At the ends are two smaller rings, but still large enough so they can't go through the main ring. There are also two wooden beads, and these can actually pass through the ring, but not through the angel's wings nor its head. Based on this information you'll have to come up with a way to remove the large ring from the frame. Solving a difficult puzzle is always a great and rewarding feeling. You know you have conquered its secret, but above all you feel you can tackle harder challenges afterwards. Wire puzzles sometimes share similar techniques and movements and when you solve a new one, you always learn something new. It's because of this that The Angel is now among my favorite wire/string puzzles. Availability: You can buy The Angel at Sloyd in Finland for just €6.05. Jean Claude Constantin continues to surprise me, even after I've seen all kinds of original and outstanding designs from him. The latest addition to my collection is Auge (German for 'eye' - and curiously, Portuguese for peak), and at first sight it doesn't look that peculiar. It's only after you unfold it that it truly reveals its form, and it's nothing short of amazing. 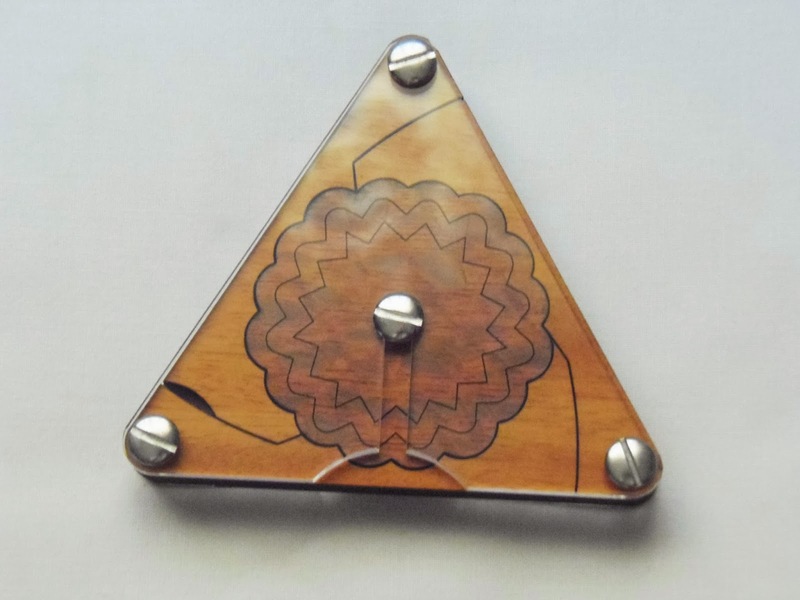 Auge has an equilateral triangular shape made of two contrasting wood colors and covered with a sheet of transparent acrylic in both sides. At the center you can see a wheel, which is actually a two-layer wheel united at the center by a metal pin. It's this very wheel that you should be removing from the frame, but not before you figure out how to move the six wooden pieces surrounding it. 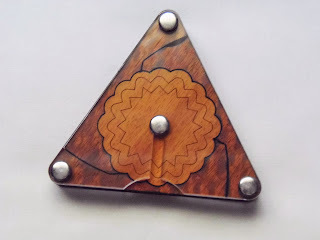 The movable pieces are attached by pins at the tips of the triangle and are only allowed to rotate about 200º, but you have to move them in the correct order or they will be blocked by the other pieces. When you open all six pieces the wheel will easily be removed, and that's when the true challenge begins... Well sort of. 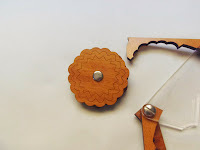 When in place, each of the wheel's two layers fit perfectly with the concave curved lines of the pieces (the wheel's protuberances have different sizes), but when you take it out and shuffle the position of the two wheels, putting it back and close the rotating pieces becomes an exercise of trial and error until you find the exact fit. You'll be doing the same thing for each side of the wheel, but the actual challenge is far from from being, well... challenging. I was actually a bit scared when I tried to put the wheel back, because I thought it was going to be really hard to find the correct positions for the wheel. Turns out, it's very easy. Once you put the wheel in place, you just need to keep rotating one of the layers until it makes a perfect fit with the inline of the rotating pieces. When you're done, close the other two parts and do the same for the other layer. It's that simple and you should be able to do this in just a couple of minutes. This was supposed to be a level 7/10, but for me it's hard to give it more than a 5/10. It's very easy to solve, and even a beginner won't find it challenging. 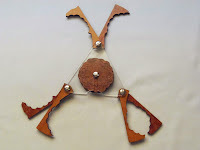 The design of the Auge puzzle is superb and the mechanism is quite ingenious. Coming from Constantin that's hardly surprising given the high quality standard he has already accustomed us. Having said that, the puzzle itself doesn't provide any real challenge and I can't recommend this one unless you're a fan of Constantin's puzzles. Availability: You can find the Auge puzzle at PuzzleMaster for $19 CAD. You can also browse dozens of other Constantin designs. Today, I present to you another one of the Flabber Floovers' puzzles, the Pulley, manufactured by Family Games America. These are pocket-sized puzzles, usually no more than 10cm (4"), excluding the length of the rope that can sometimes be too long and cause an undesired string of knots. The collection features 12 different designs grouped in four difficulty levels, and the pulley sits at level 3, which means it's supposed to be a little challenging to solve. The quality of these puzzles is superb, and it's even more surprising knowing they have a low asking price. The material is not your average plywood, it's actually hardwood, and from the looks of it, it seems it's made of birch wood, and carefully polished. The design is sleek and elegant, featuring complex and odd shapes, as if it were made by the most highly skilled craftsmen. The puzzle consists of three different wooden parts held together by two lengths of rope. One of the parts has a slot large enough to let the part with the bead attached pass through it, but it can't go much further, since the bead is larger than the slot's opening. At the end of the longer rope is a trapezium shape and a ring. This ring is what you should be removing from the puzzle, but as you can see with a closer inspection, the trapezium can't pass through it. A different approach is then needed to solve the Pulley. How hard is it, you ask? Well, not as hard as the difficulty rating makes it seem. As a level 3, I was expecting a real challenge, since level 4 is the hardest and this one is just a notch down. Turns out, I was able to solve it in a couple of minutes on my first attempt. And the solving process is really simple, with about three different steps needed. I didn't have too much trouble putting it back in its starting position either. It's just one of those puzzles you don't have to think very hard to uncover their secret. Even though I think the puzzle was easier than I was expecting, and while this could be interpreted as a let down, I was actually glad it didn't take me that long to solve, because I've had my fair share of frustrations with rope puzzles. This one, was actually a pleasant surprise. I would recommend it to anyone on the fence thinking it might be too challenging. Believe me, it's not. Once you know how it's solved it's hard to forget it, so unfortunately it doesn't have much replay value. Nevertheless, it's still a great puzzle. Availability: The Flabber Floovers - Pulley came from the Spanish store PuzzlesdeIngenio.com. Worldwide shipping available. Click here to see the other designs in the collection. 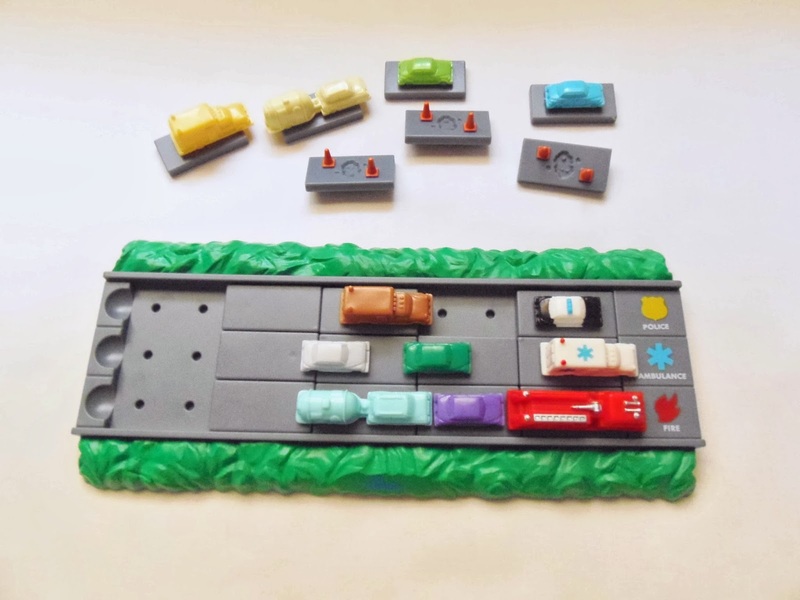 Are you a big fan of the classic Rush Hour by ThinkFun? If your answer is yes, then the Roadside Rescue is perfect for you. 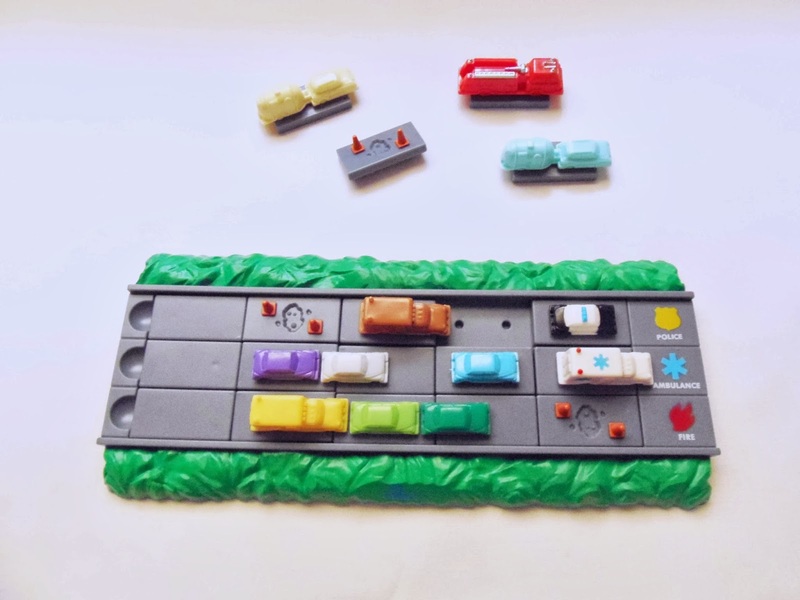 The theme is simple: you're stuck on a highway jam and you have to make way for the emergency vehicles to get on the rescue site. 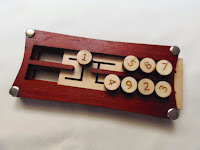 It's a very original sliding block puzzle, invented by Hank Atkins and challenges developed by Serhiy Grabarchuk. 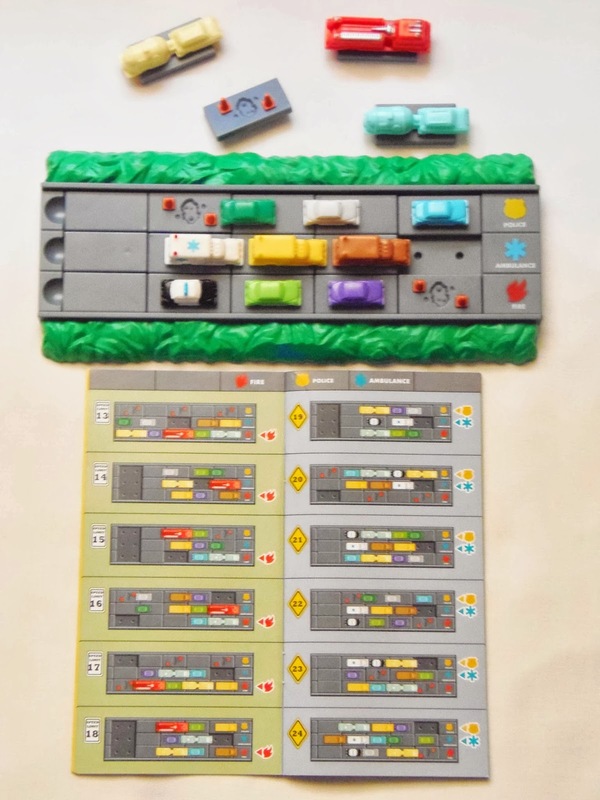 The puzzle consists of 12 vehicles, including the three emergency ones that will serve as the main tokens. There are also six blockers that can be placed in the tray and these will not be movable, they're just there to limit your movements. The frame is a 3x5 grid, so it's not your typical sliding puzzle, but the solving process is pretty much the same. At the start of each challenge you'll always have only one empty space to move your tokens, and even though sometimes it appears there are more empty spaces, the blockers ensure you will not be using them. The tokens aren't all the same and you'll soon notice this as you try to solve your first challenges. 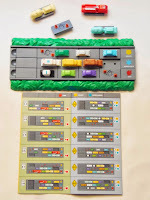 Some of the vehicles are neatly placed at the middle of the token base, but these are the simpler ones. You'll also see a few vehicles that overhang the front or back of the token bases and even front and back, like the Fire Truck. The different sizes of tokens will add a higher complexity level to the challenges, as you'll sometimes be limited to only one valid move, instead of multiple path choices. There are 42 challenges - Odd number, might as well been 50 - and they start quite simple, but soon it gets rather complex. 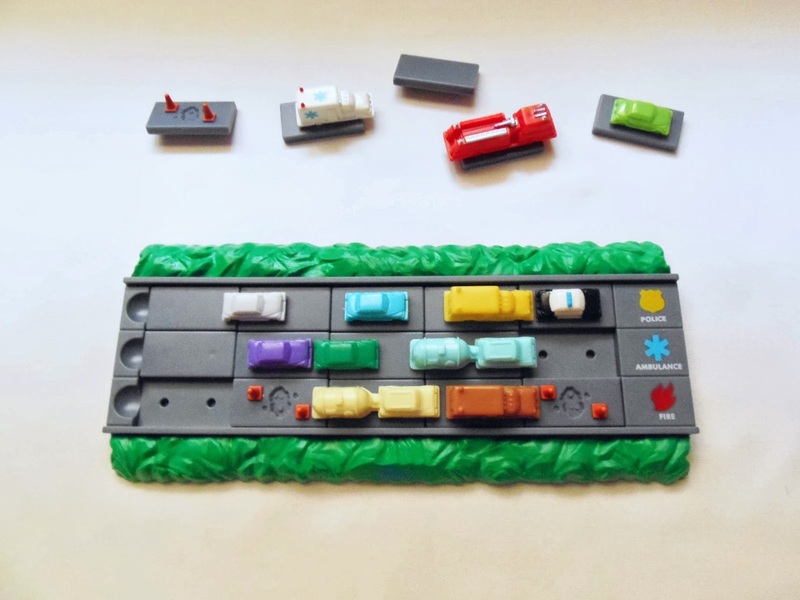 The first set of challenges rotates between one of the emergency vehicles, but as you progress you'll start seeing combinations of two and then all three special vehicles in the same challenge. 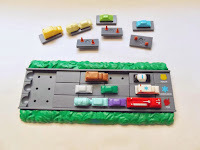 You play a specific challenge by sliding the pieces in the four main directions until the emergency vehicles are on their designated positions. It won't suffice to just have them reach the right side of the tray. I haven't solved all 42 challenges, but I did enough of them, even the harder ones, to have a good grasp of the difficulty level. All I can say is that they're not at all difficult, even when you're using all three special vehicles. 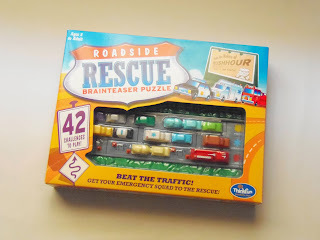 If you're good at sliding puzzles, Roadside Rescue won't cause you much frustration, but it can still be fun to play through all of the challenges. 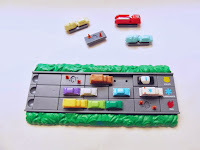 I still think Rush Hour is the best ThinkFun puzzle game, but after playing with Roadside Rescue I reckon they're pretty close in terms of fun factor. As for difficulty, I also consider Rush Hour to be much more challenging, but here it's just a question of personal preference, whether you're more inclined for harder puzzles or more accessible ones. The design is quite clever and while I've played with lots of different sliding puzzles before, it's the first time I've seen this concept. Definitely recommended for puzzle fans of all skills. Availability: You can get a copy of Roadside Rescue at Sloyd.fi. You can also take a look at other puzzles by ThinkFun here. 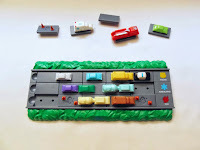 For the Deal of the Week, you can get a 15% discount on ALL ThinkFun puzzles by just mentioning the name of my blog. Offer valid until November 15. 209 is another fascinating puzzle, by Jean Claude Constantin, that uses four different mazes in combination with five pins that you need to move sequentially. I'm not sure what exactly 209 means or maybe it was the designer who didn't have inspiration for a better name. Either way, the puzzle looks stunning and that's what really counts. Manufactured with laser-cut natural wood, in contrasting colors, and finished with transparent acrylic, the puzzle looks and feels like any other quality designs from Constantin. It's a nice sized puzzle measuring 19.5cm x 4cm in length and 2.5cm in width (that's 7.7" x 1.6" x 1"). The four wooden boards also give it a nice weight that makes it comfortable to hold in your hands. 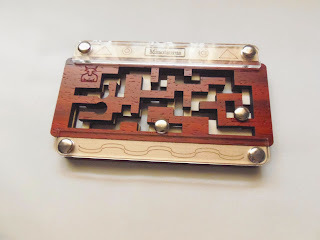 The concept of the puzzle is somewhat familiar in the way that it uses multiple mazes that need to be navigated simultaneously. This one's actually a step up in difficulty to another similar design by Constantin, the BonBon, where it uses only two mazes instead of four. There's a lot to think about as you go about solving this one with four different mazes, so be prepared for a serious challenge. You need to be constantly moving the five pins up and down to unblock the next move, as you try to push and pull the four boards at the same time. There's one important thing that might be overlooked as you first try to solve the puzzle. Contrary to what you'd expect, not all four boards are to be taken out of the frame. Actually, only one of them is possible to remove, and that's the top one. The others only serve to block most of your movements. You can flip the puzzle to take a better look of the bottom mazes, but even then it's difficult at times to know which board is blocking your next move. The fact that the actual mazes are only a couple of centimeters wide and you're trying to see through four of them doesn't help either. In this case, I believe a larger puzzle would be best, as the looks were clearly favored in place of functionality. As for the difficulty level, well it's as challenging as you'd expect from such a sequential movement puzzle. It took me well over an hour to get the board out of the frame and, as of right now, I'm yet to put it back to the start. It's that tough and I need to gather some patience to attempt another frustrating session. If you like an incredibly difficult challenge, then the 209 is the perfect puzzle for you. If you're easily frustrated, I would then recommend you to stay away from this one. 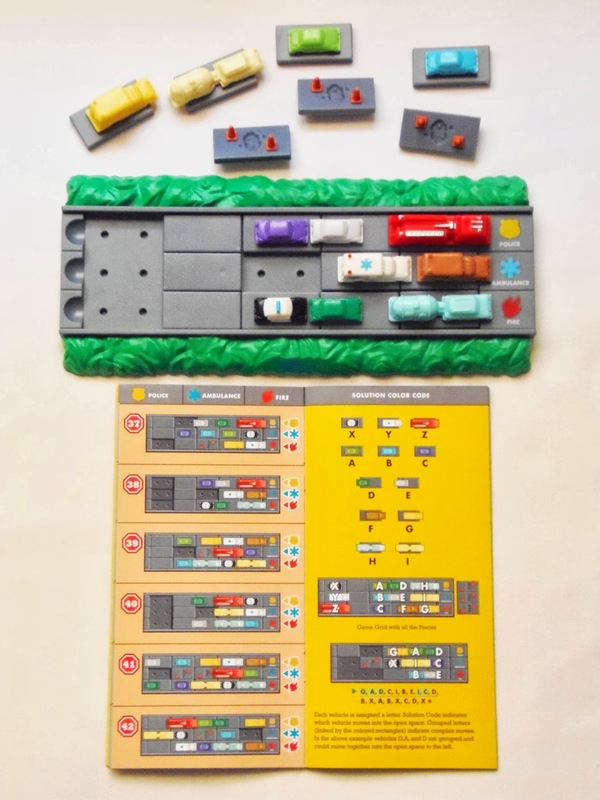 If you're like me and you're a fan of Constantin's designs, well I guess you have no choice but to add this brilliant puzzle to your collection. Availability: You can purchase the 209 puzzle at Brilliant Puzzles for about $30 USD. Click here to browse other puzzles from Constantin. Back in 2009, Oskar van Deventer was responsible for inventing a new type of puzzle that would forever change the landscape of Twisty Puzzles. This new and revolutionary type of puzzle featured gears instead of rotating faces and was simply called Gear Cube. Since then, we've seen a plethora of different Twisty Puzzles with gears being launched, some by Oskar himself, while others were designed by fans of the concept. Some of these even took the concept to the next level by making it much harder than the original. The Twisty Puzzle I have here today for review is another great one by Oskar, the Gear Shift, which is actually based on an idea by Bram Cohen, who has teamed up with Oskar on other several occasions. 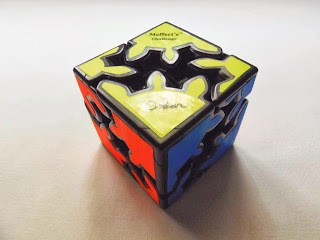 The Gear Shift could be described as the beginners version of the original Gear Cube, because it's a little easier to solve, but it's actually much more than that, since it introduces us to an ingenious new way of manipulating the core of the puzzle itself and change the way the corner pieces interact with each other. 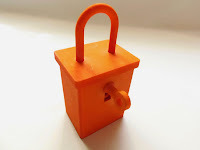 In terms of size, the Gear Shift is exactly the same size as the Gear Cube (6.1cm or 2.4"), but the pieces are much bigger in the new version. The number of pieces, however, is much smaller in the Gear Shift, totaling just 8 corner pieces, four big gears and four small ones. Also manufactured by Meffert's, the Gear Shift is presented with the classic high quality fluorescent stickers, which are almost peeling-resistant. 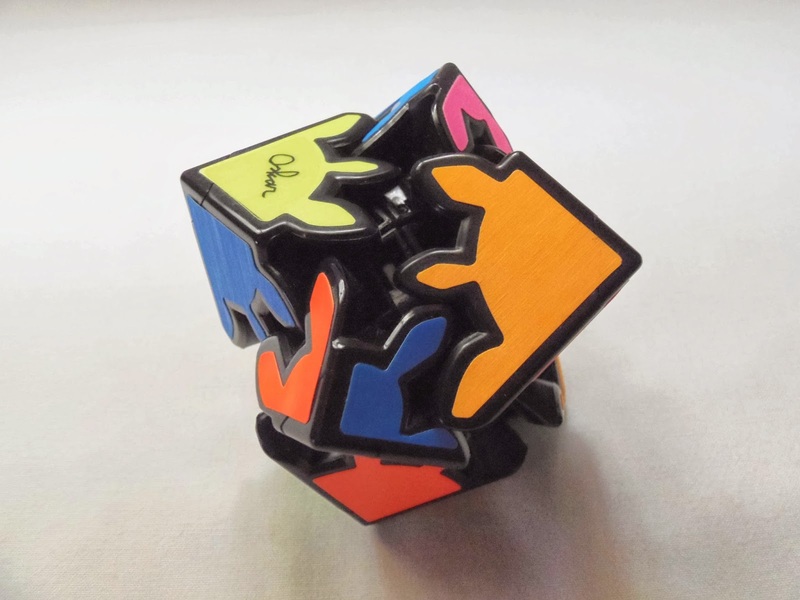 Unlike the original Gear Cube, a single move of the Gear Shift is able to rotate all eight pieces at the same time, this way easily scrambling it with just a few moves. Solving it is just as simple, but here you can add an extra "twist" and make it more interesting. As hinted above, you can change the way the pieces interact with each other by pulling the core apart along one of its three axis at a time. By doing this, you'll be able to move two opposite faces independently. In other words, four pieces at a time. I believe it's because of this pulling apart method that the puzzle is much easier to solve, since you can focus on one face at a time. Once you have solved a face do the same for the opposite one and the puzzle should be solved in no time. For an added difficulty, you can try to have in each face four different colors and solve it from there. The appearance of the Gear Shift can be a little intimidating at first, but once you get to know how the puzzle works it actually becomes quite fun to play with. Manipulating the core is a touch of genius and, knowing how easily Oskar can set new standards in the Twisty Puzzle community, I wouldn't be surprised to see new puzzle variations of movable cores in the near future. 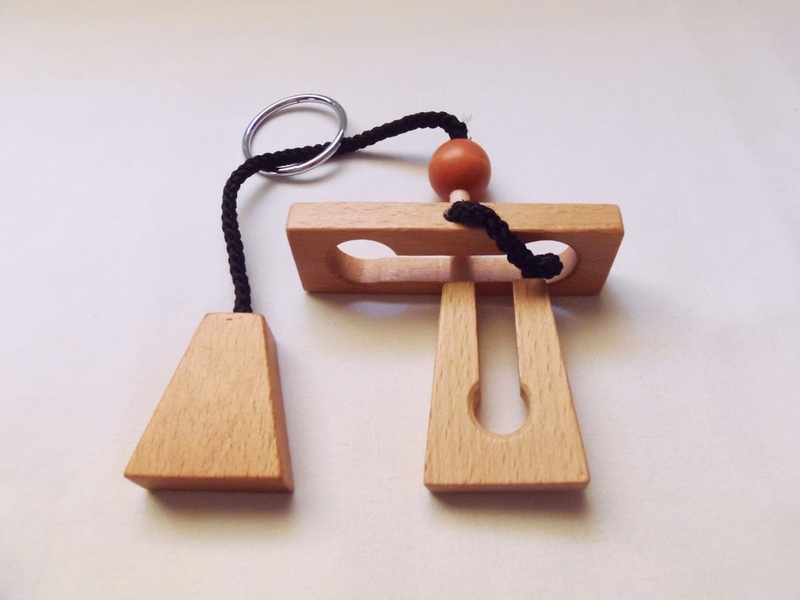 Availability: You can get your Gear Shift at PuzzleMaster for just $20 CAD. Click here to browse other Oskar's designs and here for other puzzles from Meffert's.